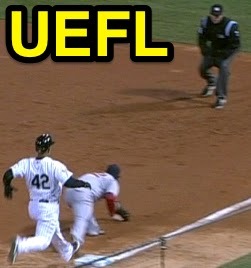 Instant Replay Review upheld 1B Umpire Cory Blaser's out call in the bottom of the 2nd inning of the Red Sox-White Sox game. With none out and none on, White Sox batter Jose Abreu hit a 3-2 curveball from Red Sox pitcher Jake Peavy on the ground to shortstop Xander Bogaerts, who threw to first baseman Mike Napoli as Abreu arrived at first base. Upon Instant Replay Review as the result of a challenge by White Sox Manager Robin Ventura, Blaser's ruling that Napoli caught the ball and tagged first base ahead of Abreu's touch arrival was affirmed, the call was correct. At the time of the review, the contest was tied, 0-0. The White Sox ultimately won the contest, 2-1, on a bot 9 walk-off. This is Cory Blaser (42)'s second Instant Replay Review of 2014. Cory Blaser is now 1/2 (.500 Affirmation Rate) in Replay Reviews in 2014. Crew Chief Jim Joyce's crew is now 2/4 (.500 Affirmation Rate) in Replay Reviews in 2014. This is the 91st Instant Replay Review of the 2014 MLB Regular Season. White Sox Manager Robin Ventura is now 0/3 (.000 Success) in Instant Replay Reviews during 2014. Umpires are now 60/91 (.659 Affirmation Rate) in Instant Replay Reviews during the 2014 MLB season.